Completion had to be delayed for a few days after the final set of searches found a Notice of Grant Conditions attached to the house, but Elaine checked them out and they’re nothing to worry about, so we were able to pick up the six sets of keys to the house last Tuesday. Mick is currently in plaster after rupturing his Achilles tendon last month, so not a lot we could get our teeth into straight off, but we went over there straight away anyway, just to go and sit inside it and feel happy for a bit 🙂 Room by room walkthrough below. The window seat will be retained (or at least reinstated after the bay window is replasterboarded, as there’s been a leak at some point in the past). I’ll put a coffee table there and two small armchairs to make a separate seating area from the rest of the room. 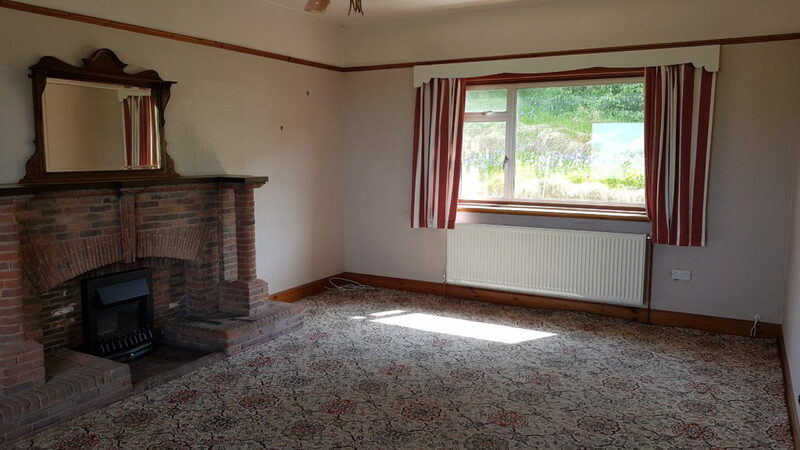 Then there’ll be a sofa side-on to the fireplace with its back to the window. This will be part of the TV area grouping at the other end of the room. TV will go to the right of the fireplace (the satellite dish has to be on the back of the house. I was going to put a corner unit in that right-hand corner, but the radiator is in the way, so there’ll be a big sofa along that right-hand wall to make an open 90-degree corner with the fireplace sofa. 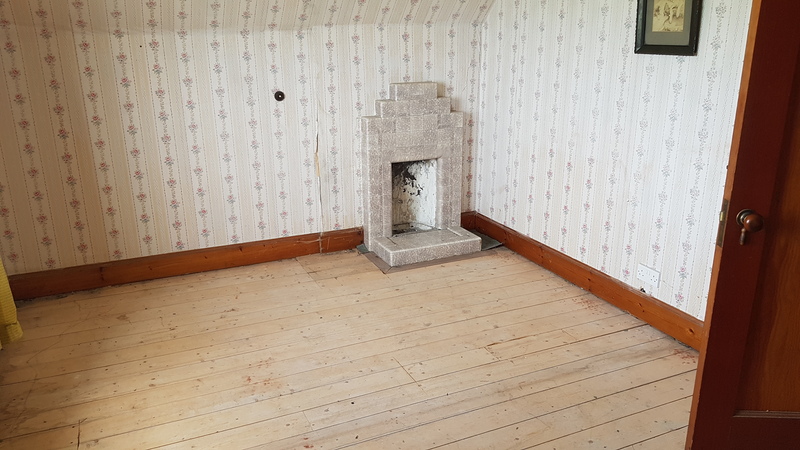 As the fireplace is such a huge focal point (we’ll take out that electric fire and replace it with a woodburner), I don’t feel I need to do a wallpaper feature wall in this room. The original picture rail is still up, so we’ll paint the room white above that and put a colour on the walls below – I’ve found some lovely tan leather armchairs and leather/fabric mix sofas with pillow backs, which are autumnal reds and greens, so I need to work out a colour that will blend in with that. The carpet is an Axminster, in Dounreay pattern(!) 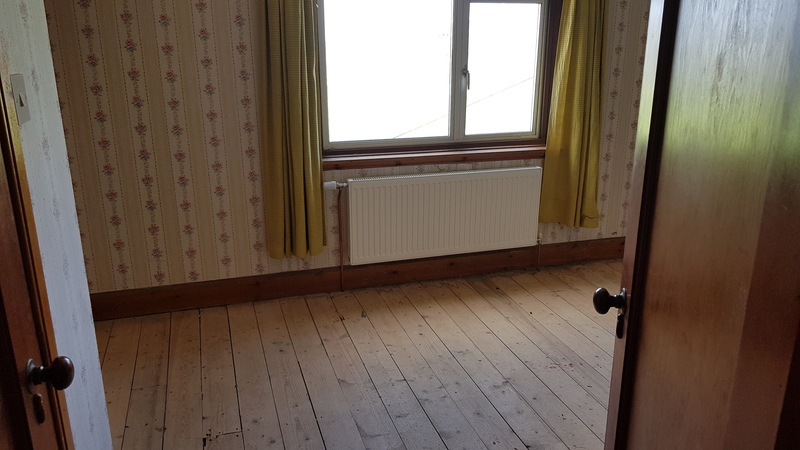 and there are some lovely floorboards underneath, but they’re straight onto joists with no insulation and there are gaps in them where Jeff broke through the floor installing the radiators, so we’ll put carpet in here – we’re going to have a neutral carpet throughout the house in all bar a few rooms. 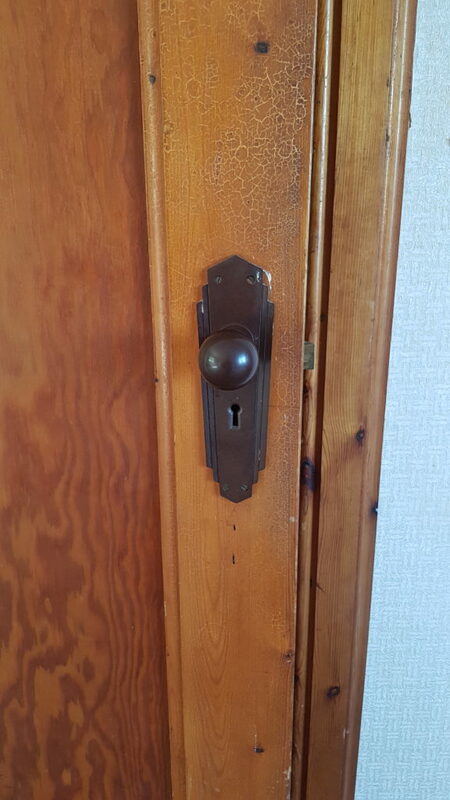 Love this art deco-style door handle. It’s a standard Care & Repair bathroom, similar to the one at Ethel’s. 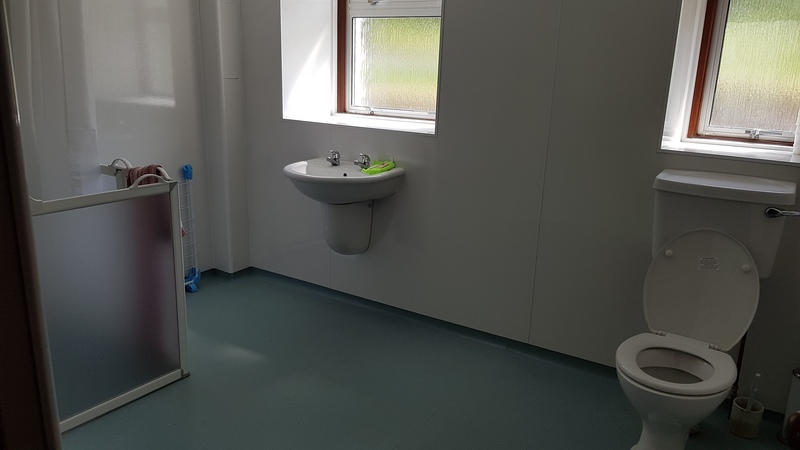 This was originally two rooms and we did think about reinstating the wall, but have decided one lovely large bathroom is better than two small separate rooms. The sink will move over to the right, a bath will go under that window where the sink is (I need to measure out, but I’m hoping to get a double-ended slipper bath in there) and the shower will be a large quadrant shower in the left back corner. The floor in here will likely be a Karndean lino in a chessboard-style tile effect. This is the current dining room. Much as everyone says, ‘Oooh, Aga! !’ it’s going to have to go, because it drinks oil like a demon, overpowers the room both physically and heat-wise, and is going to get in the way of where the dining table’s going to go. 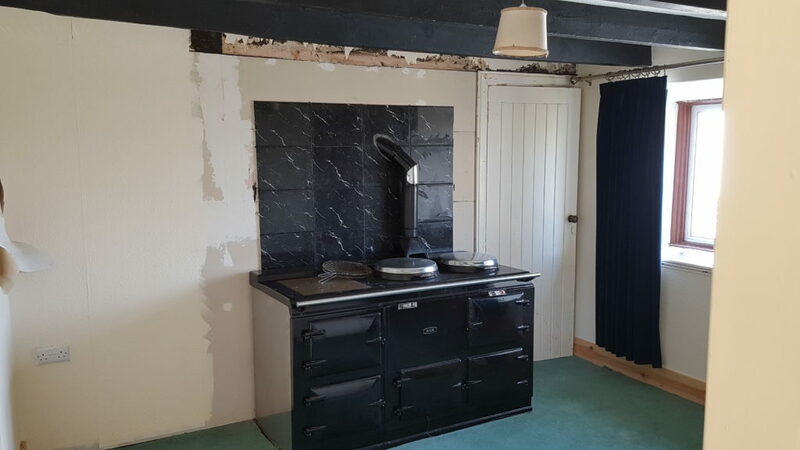 The wall to the left, just out of shot (you can see the paper peeling off where I ripped a damp bit away) is an external wall but now has the current kitchen built onto it, so Pete reckons we may be able to strip that back to be a beautiful bare stone wall without much heat loss. This is the maid’s room, attached to the dining room and shown as bedroom 5 on the floor plan. We’re going to knock this out completely to make a big kitchen/diner. The kitchen part of it will mostly be contained in here and flooring for the whole thing will be another Karndean stone-effect lino. Currently the kitchen, this will have a sink, washing machine, tumble dryer, ironing board and be somewhere for wet, muddy, sandy dogs to dry off 🙂 Karndean flooring again. 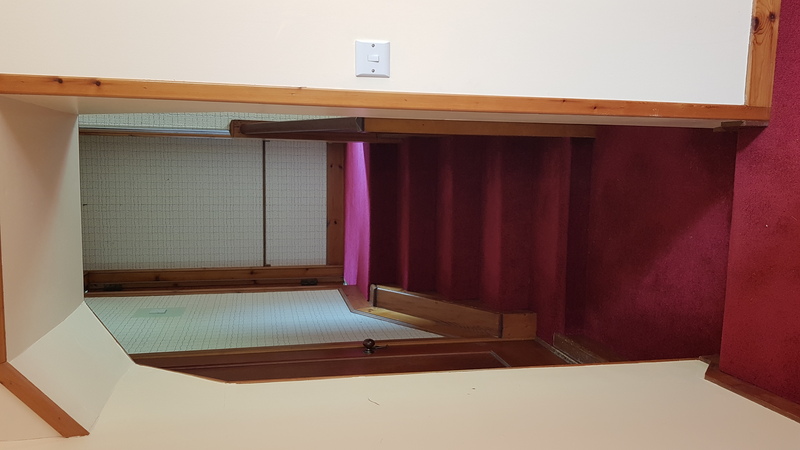 The downstairs hall and corridor, leading to bathroom and kitchen/diner. 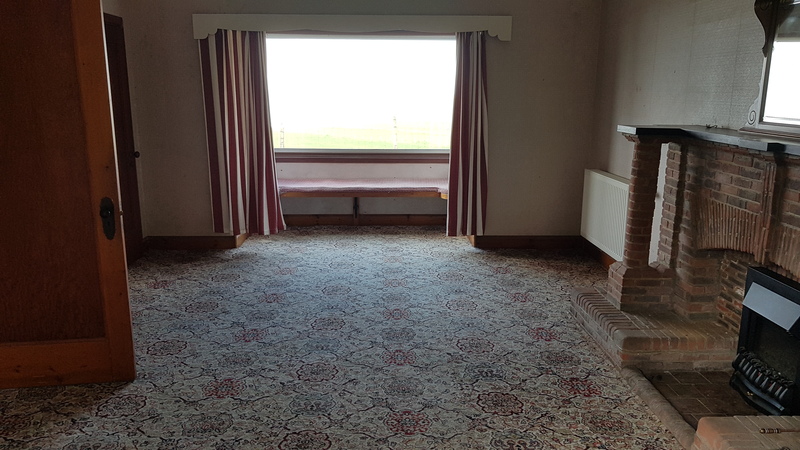 This will be carpeted and painted a neutral colour. 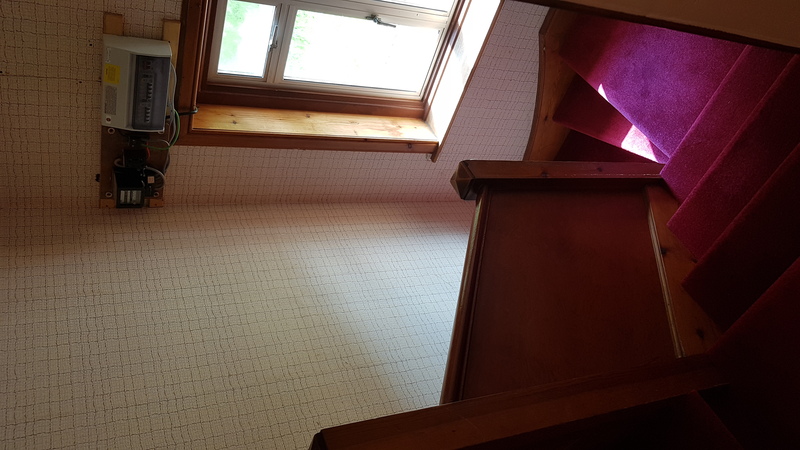 The stairwell, still with its original bannisters. That electrical gear is going to need moving, I fear, because to read the meter you have to stand on the landing and peer at it. (And that reminds me, SSE couldn’t find the house on the national database when I rang them last week, though they do currently supply it, so I have to ring them back tomorrow with the meter serial number!). 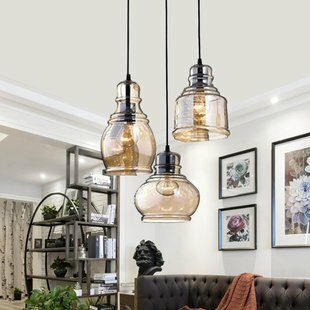 Again, this will be kept simple and neutral, though I want something quite statement lighting-wise – I’ve seen one that I love, but only on American websites, where it’s tagged as Analia vintage 3-light cluster pendant. I’m hoping I can find something similar in the UK, or maybe something like a lantern light. 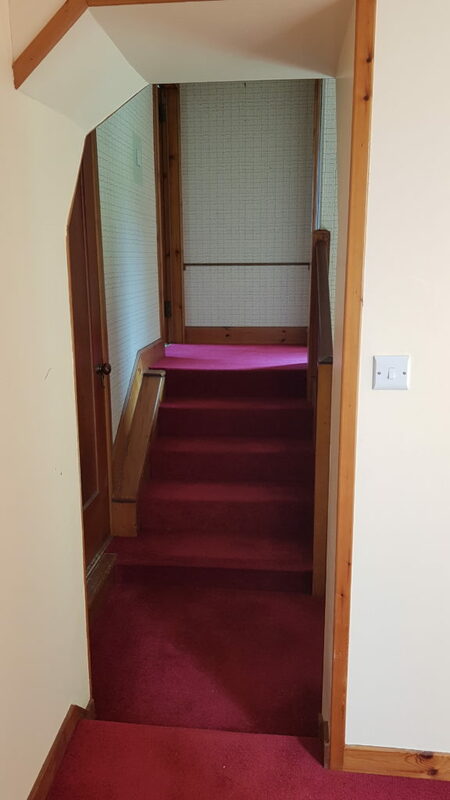 Upstairs landing – again, neutral throughout. This room is above the dining room. 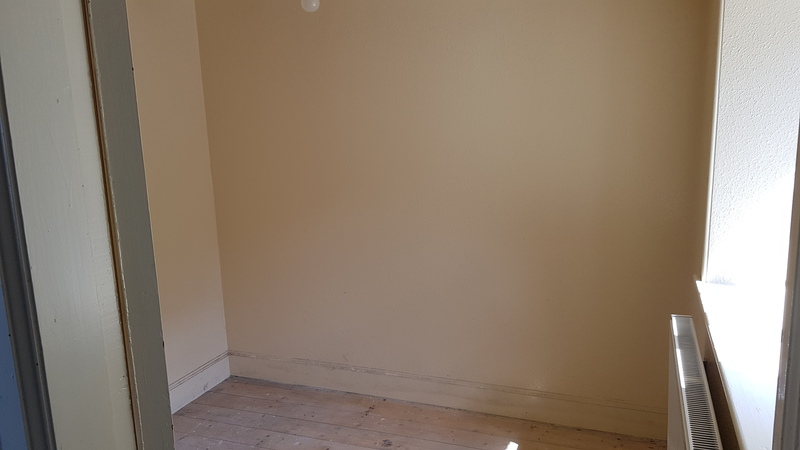 That door opens into an empty cupboard where the hot water tank used to be, it’ll be knocked out to give a bit more space and a 5ft double bed will go up against that back wall. 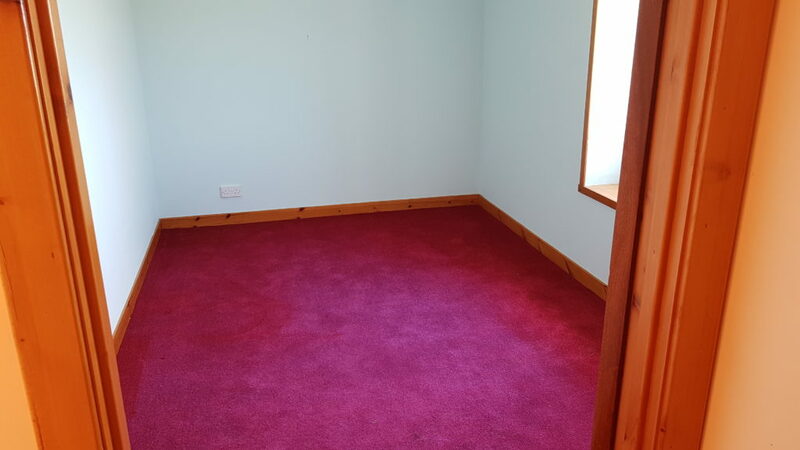 Plenty of space in here for a wardrobe and drawers. The little hatch on the left accesses the roof space above the utility room. I haven’t even started to think about colours yet. This room has a modern door on it, similar to the one on the cupboard. Fortunately by knocking out the maid’s room downstairs, I’ll free up two original doors (there are two doors in the long corridor downstairs) which can be put into this room and what will become the upstairs bathroom, as it also has a modern door. 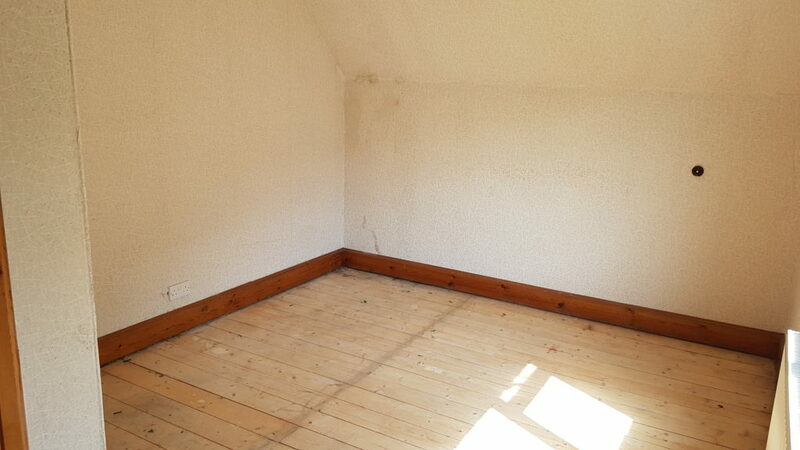 Currently a bedroom, this is going to be turned into an upstairs bathroom with a big shower, a loo and a sink. 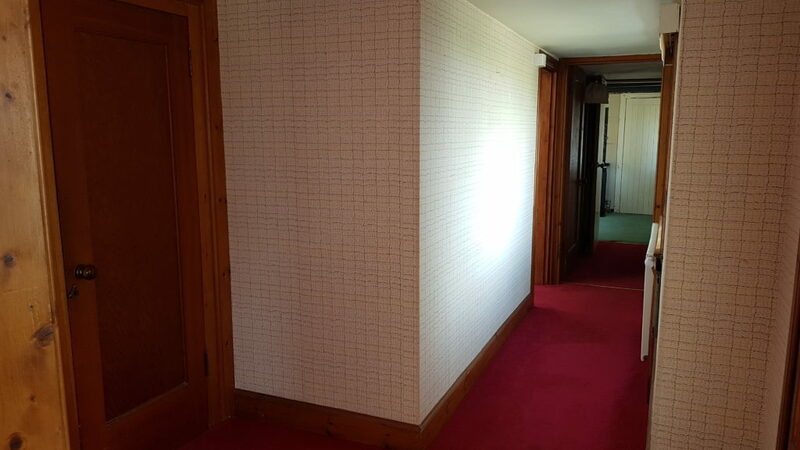 There’s a handy cupboard to the right of the doorway, which will hold spare towels and bed linen. Jeff, who installed the heating system here, says that from memory there’s a good foot of space under the floorboards before you get to the downstairs ceilings, so in theory, there’s enough room to take the pipes through that void and out the back to connect with the existing drainage and sewerage (this room is more or less above the bathroom, it’s just the corridor is on the other side upstairs), and it shouldn’t require a building warrant. 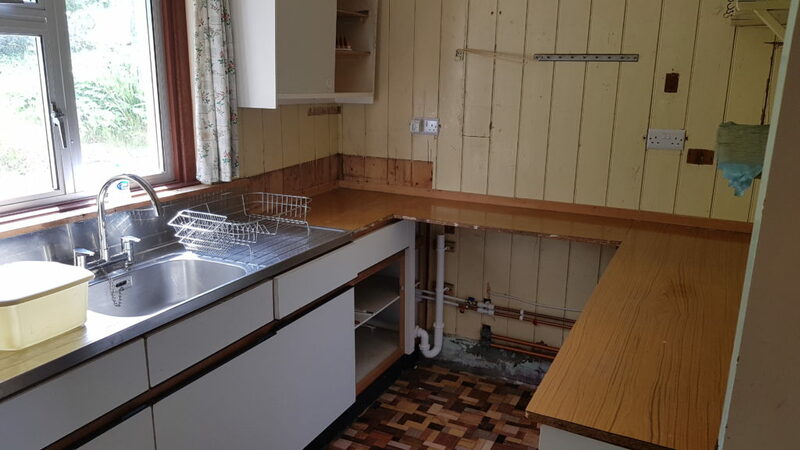 Although downstairs is currently an electric shower, I’m going to put one that runs off the combi boiler in downstairs and make this upstairs one electric – that way if there’s an issue with the boiler at any time, a hot shower will still be available. Belt and braces! 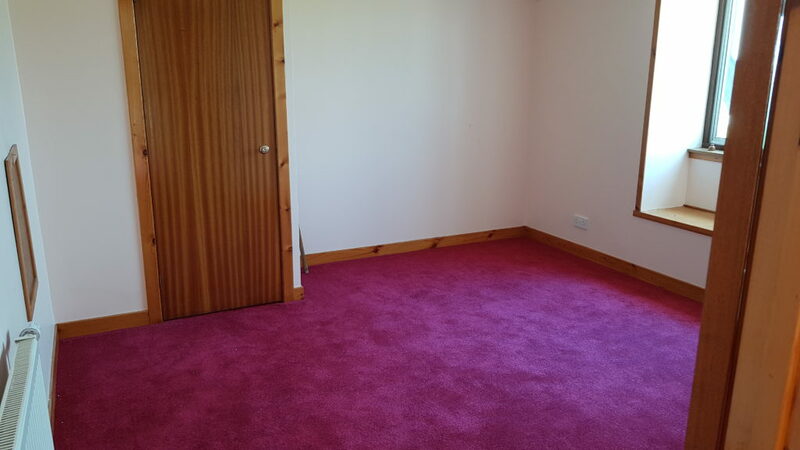 I need to think carefully about layout in this room. It’s going to be another double, so do I block off that fireplace and put the headboard against that wall, put the headboard below the picture and leave the fireplace or put the headboard against the left-hand wall in the picture below? I think I’m going to be in here with my newspaper furniture layouts again. The door just visible on the left is yet another cupboard and although the roof valley comes down inside it, I think there’s enough space in there to put a rail in and make it a wardrobe, which frees up a bit of floor space. I found the newspaper below in it, from July 1970, and just loved the second lead story on the front page. This will be the twin and will be tricky to fit a wardrobe into. Where I’m standing has the roof valley coming down into the room, so I’m going to have to put the beds on the wall where the bell push is and the wardrobe against that bit of wall to the left, if it’ll allow the doors to open. 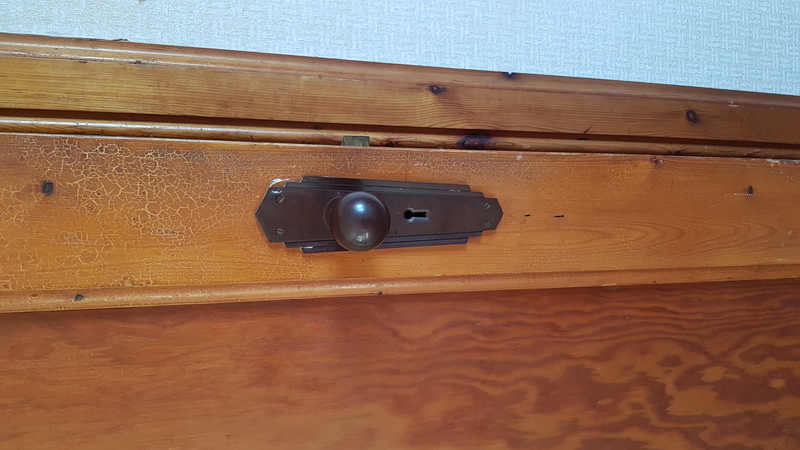 The little bit of wood on the left of the picture is the door frame. 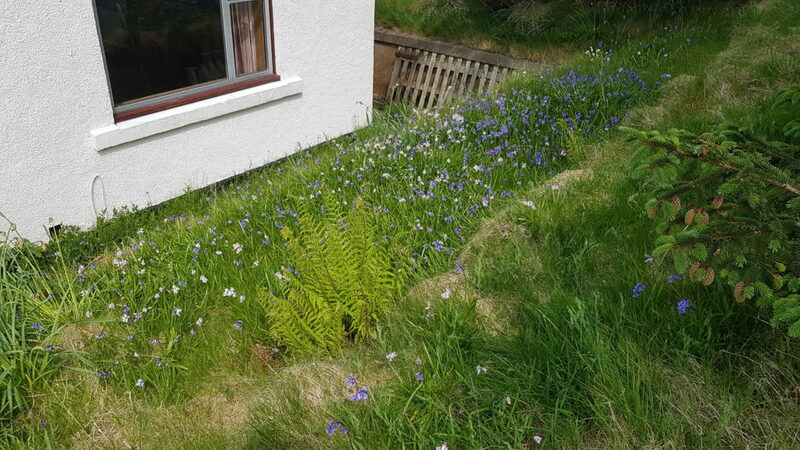 Somewhat overgrown and vertical, but it looks like this bit used to be a flower border at one time. I love the bluebells. The boundary is roughly where the tree is and that old house belongs to the neighbour, but there’s a wonderful honeysuckle growing all over the top of the garden, which I’m sure will smell glorious in a few weeks when it starts to flower. 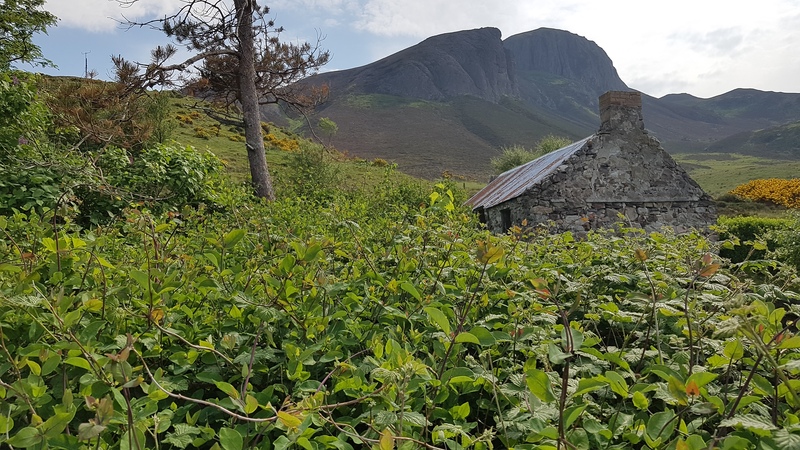 Views up to the Watch Hill are nearly as spectacular as the views to the front, and we’ll build seating out here, so that people can bring food out of the utility room door and eat out here in summer (midges permitting). I’ve already had ERG round to quote for windows. 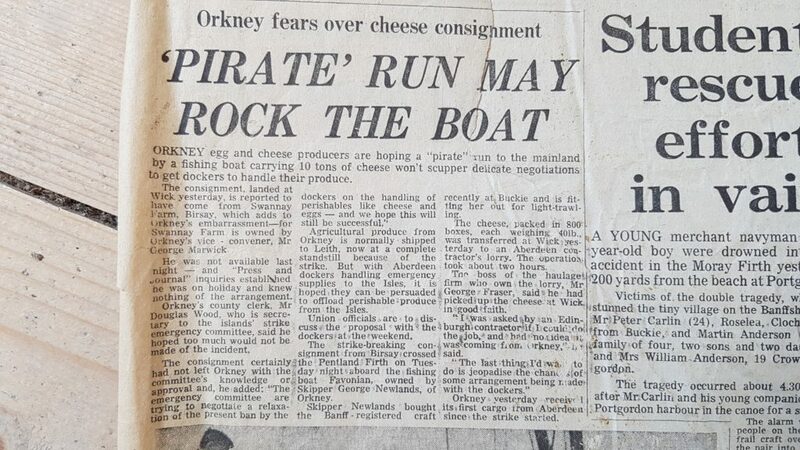 Mick guessed £24k, I thought they’d start at £22k and we’d settle somewhere around £15k. In the end, for 17 windows plus a Velux, they started at a few pounds under £20k and we got to £14,199, which I’m delighted with. 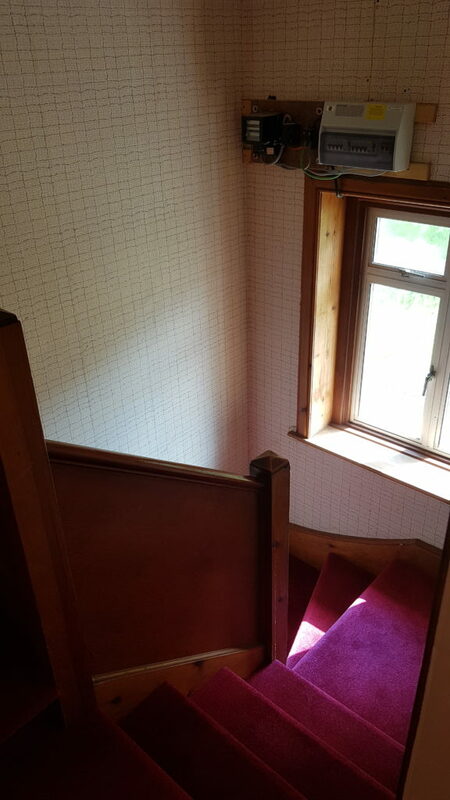 I did look at a company called Rationel as well, because they do hardwood windows and I have a real soft spot for proper wood windows in old houses, but it was going to be just that bit too expensive when I took into consideration everything else we need to do. Next time they need replacing, when I’m not trying to get everything else done at the same time, I’ll have another look. Their surveyor is coming to do a detailed measure-up tomorrow morning, then on Thursday morning someone’s coming to take a look at the asbestos garage and quote for dismantling and disposal, and Monday morning sees RDI Renewables visiting to let me know what they can do in terms of insulation. It’s a little bit damp in there at the moment, and new windows plus some room-in-roof and attic insulation will make a big difference.